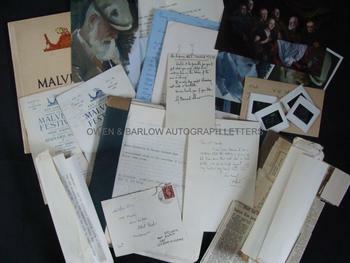 Together with ALS from his wife, Charlotte Townshend-Shaw, and a small archive of documents relating to the portratits of George Bernard Shaw painted by Victor Hume Moody, including a typscript account of the various sittings. ALS on post-card. 1p. The Impney Hotel, Droitwitch. 8th September, 1938. To Victor Hume Moody. "Would it be possible for you to get what you need whilst I am working here on the terrace if the sun is shining? If so any day except Thursday next week is availabe. We can lunch you if you like." With good full signature and addressed on verso in his hand. In fine condition. The ALS from his wife, Charlotte Townshend-Shaw nee Payne-Townshend (1857-1943) is 1p, The Impney Hotel, Droitwitch. [No date but with original envelope postmarked 12 [?] September 1938. To Mrs [May] Moody. "I have some business to do in Malvern while the sitting is going on but I am sure there will be time for tea - as you so kindly suggest. Only my husband very rarely takes tea!" Together with a 20pp document (mainly typescript but partly in manuscript, including drafts and revisions) giving a very interesting account of Moody's meetings with George Bernard Shaw - his eating habits, Shavian outbursts, his conduct and conversation during the sittings, etc. Together with colour photographs and transparencies of Moody's portraits of Shaw and various other correpondence and documents relating to them. Also included are various programmes for productions of the George Bernard Shaw plays which had their world premieres at the Malvern Festivals of 1938 and 1939. From the studio archive of Malvern artists, Victor Hume Moody and his daughter, Catherine. V.H. Moody made three portraits of George Bernard Shaw at various times, all in connection with the Malvern Festival. 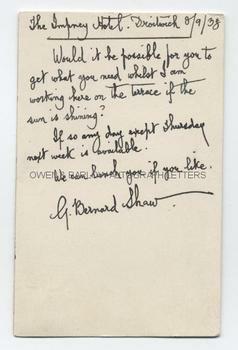 This correspondence relates to the last painting, believed to be the final occasion on which George Bernard Shaw sat for his portrait, in 1938. 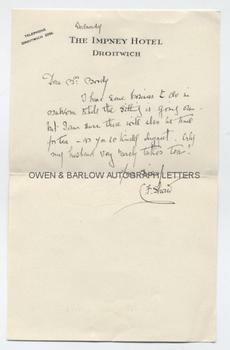 According to Moody's account, Shaw's play 'Geneva' had just premiered at the Malvern Festival but Shaw wanted to revise it as he said "the last act must be re-written because Mussolini has let me down. He has taken to anti-semitism and I did not bargain for that". Consequently, Moody was obliged to do the preliminary work on the portrait whilst George Bernard Shaw worked on the terrace at his hotel in Droitwitch. Shaw subsequently attended for further sittings at Moody's home in Malvern, where the portrait was completed. According to Catherine Moody, the two became quite close friends. Catherine Moody and her mother, May, were present at the sittings and the typescript account is their collective recollections of Shaw and his conversation. Aside from small extracts that appeared in the Malvern Gazette, it is, so far as we can establish, unpublished.